Receipts, scraps of paper, rulers, apple corks—that’s just some of the things readers use as bookmarks. But there are other readers, just like our Bookmarked friends here, who take it to another level. They have vast collections of some of the best page markers ever made that are practical and eye-catching. You may also find some more that are both sensible and cute on Sashi’s Squad, maker of Bookbed’s Fine For Spine bookmarks. Read our interview (or of course, bookmark it for later!) with the hands behind the paws that produce such handmade crafts. Shayne Pechayco is a 25-year-old licensed nurse and the crafter behind Sashi’s Squad, the maker of Bookbed #FineforSpine bookmarks. She likes the colors blue and mint, dogs, watching movies and coffee-flavored ice creams. Follow her @sashisquad. Hi, Shayne! 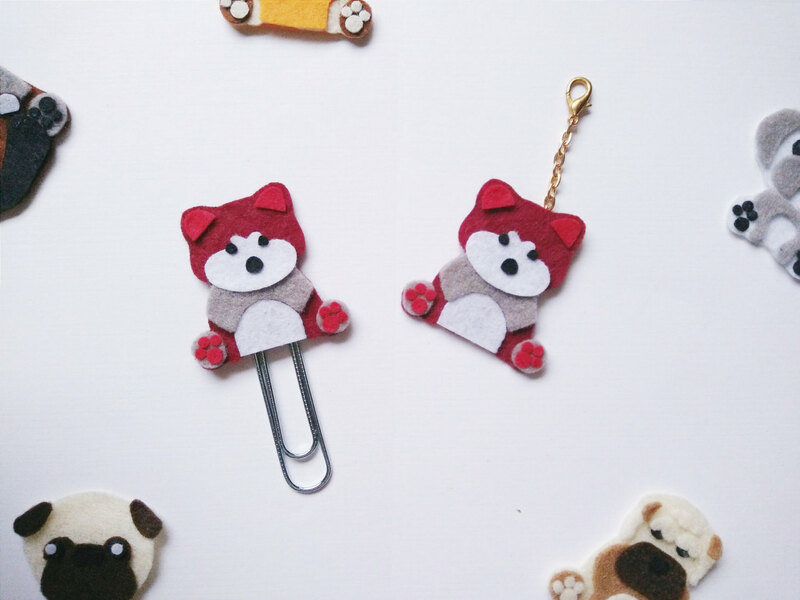 Sashi’s Squad has the cutest bookmarks, clips and charms we’ve ever seen! Can you tell us how you came up with the idea? Why Sashi’s Squad? 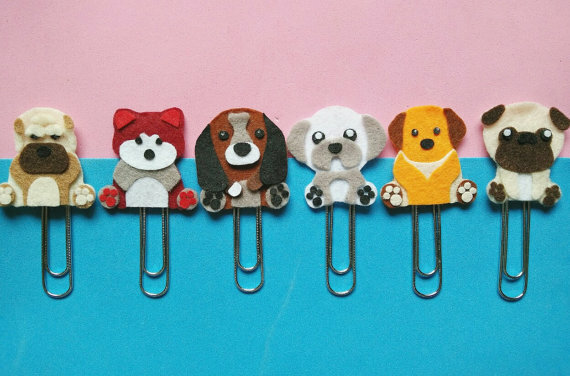 Why does the squad seem to be all dogs, and why bookmarks (not that we’re complaining!)? My brand’s named after my dog, Sashimi, an eight-year-old Shar Pei. Everything started as a creative outlet after I left my first job. While on a career hiatus, I picked up on felt crafting again, a hobby I discovered right after college. Only this time, I decided to pursue it as a passion project. 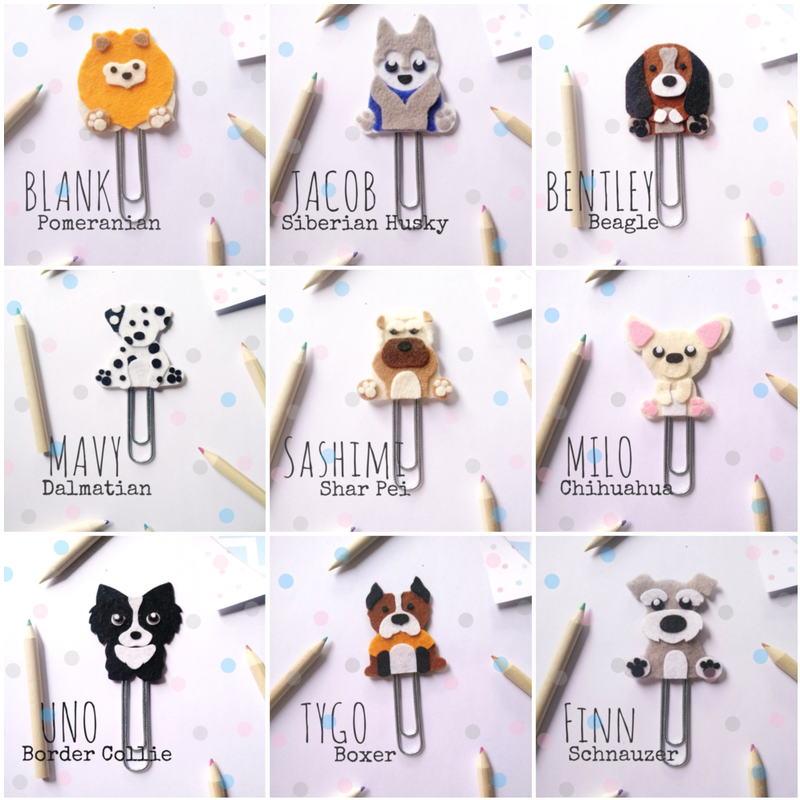 At first, I was just copying designs I saw [online] that are cute and easy to make, then the idea of coming up with dog breeds popped up. I wanted to make something that would always remind me of Sashi but Shar Peis are quite tricky to make so I tried making other breeds first, which became like the mini mascots for the squad. We see other “characters” on your Instagram feed (@sashisquad)! How do you come up with designs? Can you walk us through your creative and production process (from choosing materials, to cutting, etc.)? Most of my products [are] based on things I like such as dogs, books and ice cream. My production process usually begins with plenty of research and pattern-making. I chose felt because it’s like playing with paper. Once I’m done with the patterns, I then cut the parts and figure how to layer them best at the same time deciding if the colors compliment each other. After I [lay down] everything, that’s when I start stitching starting from the smallest of details to the outer parts. Wow, that’s a lot of detailed hard work! Surely, you’ve had some good and bad times. Can you share with us your favorite items? How about items that made you feel “frustrated” or items that took a lot of energy to make? My favorite items are the dogs, obviously. Especially Manse, because he’s the only red dog I know and he’s the same breed as Hachiko. They are also the ones that took a lot of energy mostly because of the fine parts. It’s a love-hate relationship! Sometimes I’m tempted not to put eyes or paws just to skip that part. :p Although, I [believe] all the good things require much effort. Oh, we definitely agree. Creativity can mean so little without effort. Now how about your customers? Any favorite anecdotes/stories to share about them? 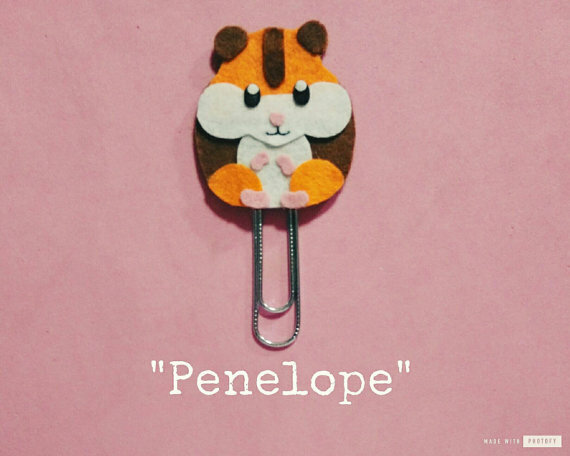 I had a buyer who requested for a hamster paperclip and I found it challenging because I [have] never made any other animal design aside from dogs. My initial drafts kept looking more like a monkey, so I had to revise quite a few times. Nonetheless, it’s my favorite because it was my first international order and hooray for small wins. (Hooray!) [It feels so good to have your work appreciated by people from the other side of the world. What’s next for Sashi’s Squad? Will you be open to more collaborations? Sashi’s Squad just launched a new chapter: Aside from bookmarks, I’ve decided to make notebooks and other paper goods. I also have some ideas I would like to test, so people can expect to see new products as the squad continues to evolve! Can you tell us about your background as an artist? Have you always been creative? Given that you’re into making art related to books, have you always loved reading? I have always been a DIY-er but was never the go-to artist kid growing up. I do not know how to draw or paint, which, I think, are both very important skills in being an artist. My background is pretty limited to school projects, or decorating contests in my previous workplace, too. I was just lucky enough to have been able to spend some time making art, and was even luckier to sell some of it. Somewhere along the way, something fun happened and other people started noticing and asked me to come along and play (hello, Bookbed!). That’s been my journey, so far. Reading? Yes. It’s [something] I could always immerse my self into anytime and anywhere. 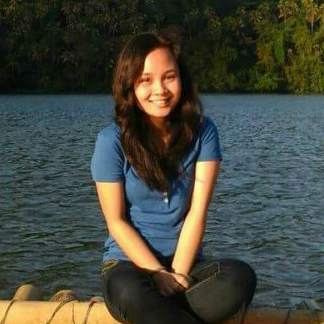 When I was renting a place in Tagaytay for more than four years, I didn’t have a television so I mostly spent my days reading away. Art can make you feel a lot of things, much more actually making it… Was there ever a time you felt like “I can’t do this/Why am I doing this, anyway?” What made you feel that way and how did you handle it? Sometimes, if it’s a personal experimentation, I totally scrap the idea if I feel that way. I believe that whatever you do should make you happy. Other times, I take a break—maybe watch some movie or do nothing for a couple of hours just to refresh. Then, I go back to creating. As an artist who sells her work, what can you say so far about the industry of handicrafts online/in real life? Do you have any piece of advice to those who are on the same page (of felt paper, haha) as you are? It’s a beautiful time for the handicraft industry but still, small business is hard. Try to remember that Rome wasn’t built in a day, and that if we really want to go somewhere, we just have to take the first step. Then, more small steps. Every day. Harry Potter because it’s a story I grew along with. Haruki Murakami and Paulo Coelho. I also like Gillian Flynn. Any favorite art/book/reading related quote?